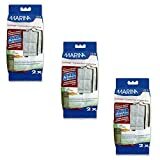 Marina i25 replacement Power Cartridge is made specifically to fit inside the Marina i25 internal filter. Its unique design forces the water to enter through the centre of the cartridge. As unfiltered water enters the two-chamber cartridge, it first passes through the zeolite chamber, which removes toxic ammonia. The water then enters the activated carbon chamber, where pollutants and odours are removed. The water then enters the floss layer, which traps dirt and debris. This unique flow of water results in a crystal clear water. For best results, replace every 4 weeks. This package contains 2 Power Cartridges. This entry was posted in Aquatics and tagged A134, Bundle, Cartridges, Marina, PACKS, Replacement by One Boutique. Bookmark the permalink.